I've become quite accustomed to doing my mani's at home while being on a budget. It's also something soothing to me and gives me the opportunity to focus on myself for a few minutes. That being said, I've played with an excessive amount of base + top coats as well as different lotions to maintain soft cuticles and I feel I've finally come up with the best yet, so naturally, I have to share! This stuff does exactly what it says it's going to and stays in place. I love that it's quick to dry without being a "quick dry" polish and the sheen it provides is perfection. I have tried Essie, Seche Vite and other Sally Hansen products, but this is the holy grail. #LIFECHANGING. But really, the consistency of this is a thick paste and rubs into a thin cream as you work it into your hands and leaves settle layer of oil which is amazing for your skin to soak up. This is something I don't apply during my mani but after when my nails have dried so I can relish in the crisp lemon fragrance and soothing it provides. This goes without saying but you don't really need to invest in this area. As long as you have the basic tools to maintain a clean foundation for your polish, you're set. I personally have all Revlon in these items because Ulta had a sale at the time I was shopping. 1 | I like to remove all my polish with a pure acetone polish remove. This gets in there nice a quick so I don't have to scrub longer than it actually takes me to paint my nails. 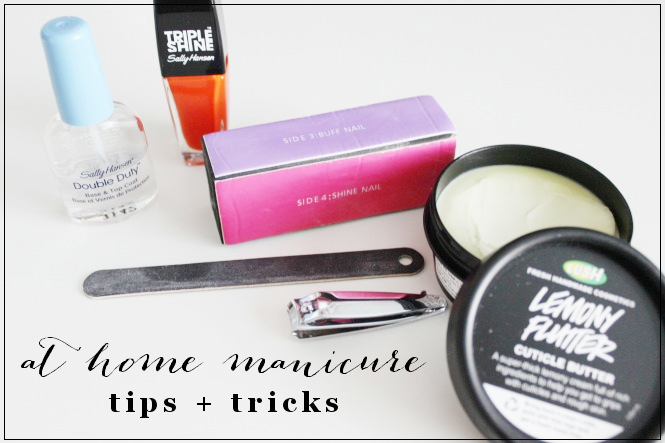 2 | Trim your nails to your desired length (I like them short with no white showing) and follow up with filing to make them clean on the edge versus sharp. 3 | Buff everything out so you have a great base for your polish. This is where you can get all the nasty cuticle overgrowth off and shine them up. 4 | Paint! I start with my base coat letting it fully dry before adding my color. I also let each layer completely dry between applications so I don't have a sticky mess of wet nails waiting on to dry. That makes the process much quicker for me! What are some of your manicure tips? Emily of Cupcakes & Cashmere also posted on mani's yesterday, see it here! That lemon flutter sounds amazing - I'd keep that on my night stand to rub into my fingers every night if I had it. My biggest tip as a former manicurist is: If you push back your cuticles ever, please only do it when your hands/cuticles are wet and have been soaked. And PUSH GENTLY - even I have a tendency to OVER push and it will leave dents in your nails as they grow out. Everytime it happens I'm like OMG, what did I do??? SO even former pros make mistakes. I am so glad you said to use basecoat I think too many people skip that. My favorite is Orly's Bonder. It not only helps the color stay on your nails but will often help prevent major yellowing of your nails when using dark colors. I always finish up my manicure after my top coat dries a bit with some cuticle oil (like Solar Oil or any cuticle oil you can find in a small bottle) just brush it on liberally on the cuticle area and let it sit. As your nails dry, your fingers will absorb this. I am HORRIBLE at doing my own nails……maybe I need to try some of these products??? I've been using Double Duty for a few years now and like it a lot. I only used it as a top coat, though, and have the Diamond Shine or something like that from Sally Hansen for my base. I also just recently got Orly In a Snap top coat which left my nails soooo shiny. It was great. I still have trouble keeping polish on for even a week, but that's partially because I pick at any little imperfection, so it ends up coming off sooner. I'm a huge fan of Gelous. I layer it with my color of choice (usually 2-3 layers of Gelous and the color) and then put a topcoat on. I'll have to try Double Duty!